Join us for the finals and post-season party Nov. 30! We're closing in on the finish of a great season. It's been wonderful playing with old friends and, as always, making new ones. Read more about Join us for the finals and post-season party Nov. 30! 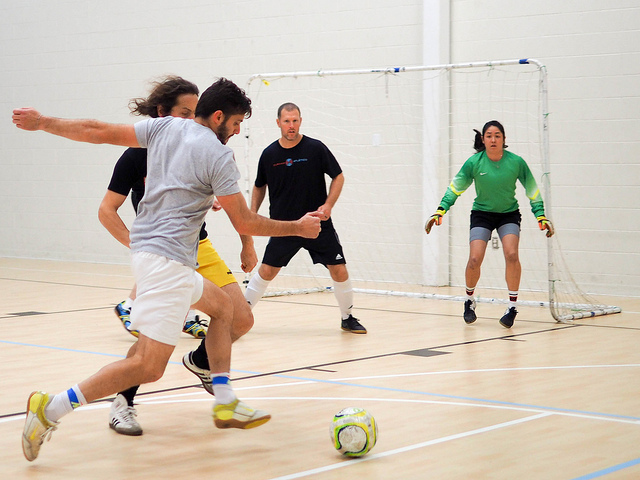 Fall registration is now open for futsal and soccer, too! There's no offseason in futsal. We're still wrapping up the first and third divisions, but it's time for us to begin registration for the fall. Read more about Fall registration is now open for futsal and soccer, too! Registration is open for spring 2017! Thanks to everyone for an excellent winter 2017 season, and congratulations to MVFC for the double (winners of the Division 1 cup and Division 1 regular season), LDE (winners of Division 2 regular season), Municipal (winners of the Division 2 cup), and Tolima (winners of the Division 3 regular season). Read more about Registration is open for spring 2017! Almost two years ago, we introduced adult futsal to Durham, beginning with six teams and about 50 players in a tiny gym in south Durham. Since then, the growth in numbers, and the increase in quality, has been staggering. Durham Atlético is pleased to announce that registration for fall 2016 futsal and soccer leagues is open! Games start the week of September 12 and will run for 10 weeks. Please register now as we will run out of space! You can find detailed information about cost, where we play, and information on how to register at https://www.durhamatletico.com/registration. We're happy to announce that the Durham Summer Cup of Futsal kicks off today with matches at The Cage between Greece and Wales, Chile and Ecuador, and Brazil and New Zealand. If you'd still like to join in the fun, please contact us today; some teams could use a few more players. The summer futsal cup starts soon: what country are you? We've just finished the spring season and we've got a lot of developments to report. Read more about The summer futsal cup starts soon: what country are you? We’re doing something different this summer: We’re having a futsal competition on the World Cup-Copa America-Euros model. Group play begins the week of July 11, and a knockout tournament follows. We are going to use this tournament to raise money for players who sustained costly injuries this spring. Proceeds from the group stage, after expenses, will go to help these players with their bills.